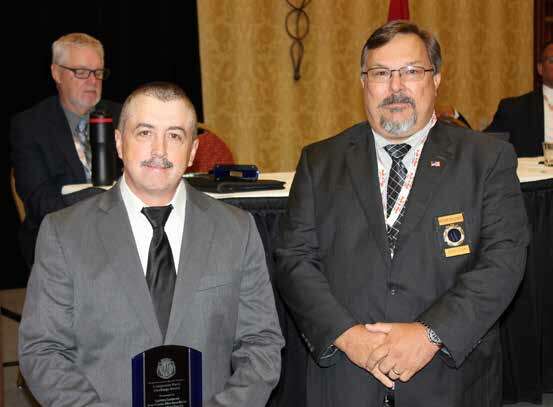 This award is intended to honor any person or unit possessing the qualifications of an active member of IAATI, although membership is not a perquisite, who has in some way distinguished themselves in vehicle theft investigations where VIN labels or micro-dot technology played a significant part of the success of the investigation. This year’s winner was United States Customs and Border Protection Sgt. Steve Warriner. Sgt. Warriner is assigned to the Port of Entry in Trout River New York bordering the Canadian Providence of Quebec. In February 2014, Sgt. Warriner was investigating the contents of a shipping container being shipped by a Numbered Company in Quebec to the Middle East. The container contents which were labeled auto parts appeared to contain more than what was listed on the bill of lading. A check of the container proved that he was correct. The contained did contain assorted auto parts, but also included a front clip from a BMW (VIN removed) and several “A” Pillars with the Federal Safety Certification Label scratched off. The “A” Pillars were cut and were out from the cars and were worthless (only for junk). The investigation pointed to the numbered company in Canada and it appeared the owner of the shipping company was a known suspect of vehicle theft. A few weeks later, two more containers were sent out by this company (via rail) destined for the UAE. Sgt. Warriner immediately set up a VACIS (Vehicle And Cargo Inspection System) (X-Ray Imaging) exam of the containers, which revealed that there were at least 6 – 7 vehicles in the containers which were again labeled as auto parts with a combined listed value of $ 67,000.00. The containers were held, the “meat and potatoes” of the investigation. Sgt. Warriner, along with members from other various law enforcement agencies off-loaded all the contents of the containers: a multitude of; fenders, doors, hoods, quarter panels, glass, sunroofs, airbags, headlight assemblies, and other miscellaneous parts). An examination of all the parts found that several anti-theft labels had been removed in an attempt to hide the identity of the parts. The parts were all photographed and categorized. 7 front clips in the containers all had the VINs removed, in an attempt to hide their identity. Anti-theft glass etching was found on several parts, which lead to the true identity of the vehicles. After all was said and done, and the parts were identified as stolen, 7 vehicles were recovered, along with several parts from 6 other stolen vehicles – all were stolen from the Greater Montreal, Quebec area. Total combined amount was over $ 300,000.00. But the case did not end there. 6months later, the bad guys were at it again, and attempted to ship (via rail) another container which was also found by Sgt. Warriner to contain another 4 stolen vehicles. The same process was conducted, parts were off loaded, photographed and categorized. Vehicles again stolen from the Greater Montreal Quebec area, with a combined total of over $ 175,000.00 were recovered. Congratulations to Sgt. Warriner on a job well done.